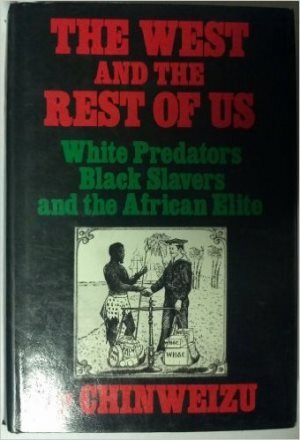 AFRICANGLOBE – The West and the Rest of Us is a well-researched book written by Chinweizu, which I bought more than 30 years ago in 1984 at the Monthly Review Press in New York, a socialist publishing house in the hub of capitalism. Published in 1978, the book is as pertinent today as it was in the 1980s and 1990s. Chinweizu, a Nigerian author, dedicated his book to victims of the West’s assault upon the rest of us, especially to Amerindians and Aborigines of Australasia who were exterminated and expropriated, millions of Africans who were enslaved in the Americas, countless Africans who died resisting European invasion and occupation, soldiers from the Third World who were conscripted to fight and protect western empires, Third World liberation fighters who have struggled for a better future for their people, and to all of us who want to achieve a just, non-imperialist and enduring peace with prosperity for all humankind. The preface to the book begins with a disclaimer that it is not a work of protest, but a critical investigation into the purposes of Western imperialist expansion during the last 500 years. It attempts to explain man-made root causes of Africa’s backwardness, a concept which was popular among Uganda’s new breed of liberators who stormed Kampala on January 25, 1986. It is amazing and telling how the revolutionary language of the 1980s has now been replaced by aggressive language and especially the culture of eating deception, corruption, impunity and what socialist intellectual Samir Amin calls accumulation on a grand scale. Chinweizu’s work is a damning and scathing attack on Africa’s political and ruling elites who love to imitate the West, including copying bad ideas like wholesale liberalisation and privatisation of key sectors of the economy such as, energy and water, which should be a preserve of the public sector. As the author argues, it is suicidal for the lambs [read Africans] to see, think and act out of assumptions about the world that reflect and advance the interests of the lions and jackals preying on harmless and defenceless sheep. The book is divided into five parts, namely, global aggression by the West, the Euro-African connection; slaving, conquest and colonisation; neocolonial Africa: a study in mal-development; the African elite and the black condition; the West and the rest of us. In this chapter the author argues that since independence, the African elite have proclaimed that it is their aim to foster economic and cultural development of Africa, but the record is disappointing. Nevertheless, the establishment of the OAU in May 1963 and AU in 1999 is a positive outcome of efforts to achieve a desirable goal championed in the 1960s by African leaders such as Kwame Nkrumah, Julius Nyerere, Haile Selassie, Gamal Abdel Nasser, Milton Obote, Kenneth Kaunda, Sekou Toure and Diallo Telli. Pan Africanism which predates independence, inspired the struggle for self-determination and continues to be a major preoccupation of the African elite. In Uganda, some pseudo pan Africanists have adopted pan Africanism as their political party ideology, but the actions of these people in DR Congo and elsewhere betrays their commitment to pan Africanism and leaves a lot to be desired. The received political faith of most of Africa’s elite and petite bourgeoisie is liberalisation and privatisation which were stealthily imposed on Uganda and many African countries in the 1980s and 1990s by the World Bank and IMF. These Bretton Woods institutions often recruit local agents and use them to push their reactionary agenda in African countries. I bet we have many such operatives in our Ministry of Finance, Bank of Uganda and other strategic organs of government. Chinweizu argues that these well-paid agents “have a special job: to spread the liberal ideology in Africa, to maintain a black front there for a neocolonial world order run by the West”. These are the folks who shamelessly sold UCB and UEB for peanuts and dismantled Uganda Airlines, CMB and UDC before giving away public organisations such as Dairy Corporation. Part five titled: “The West and the Rest of Us” consists of five chapters, including “Africa and an Alternative World Order” which I will discuss next week. On this day in 1986, a lean young man announced from the steps of Parliament that a fundamental change had just taken place in Uganda. Thirty-one years later, most Ugandans, especially those from the east and greater north, are waiting to experience the fundamental change which nobody talks about anymore. Previous articleIs South Africa Putting Africa Last Under Jacob Zuma?